The two of us have been looking at how to create more trust in our lives and in the lives of others for many years but in the last few weeks, we’ve gotten some true “ah has” that we want to share with you about what trust really is and how to create more of it in your relationships. Some of these ideas and insights may be pretty far out but stay with us because we think it will all make perfect sense to you.One of the things we’ve discovered about relationships is that…You, we and EVERYONE we’ve ever known has “rules” for how we want to be in our relationships and live our lives.In fact, we all have “rules” for everything. We have “rules” for what’s acceptable to us, what we want, what we don’t want, how the people in our lives should (and shouldn’t) act, how much security we need to feel safe in the world, how often we want to make love, how much money we want or need and everything else in our lives. You can learn to consciously choose which rules you want to follow in your life but most of us don’t. *When a person “trusts” another, he or she has the belief that the other person will act in such a way that is in alignment with his or her “rules” for living. As long as this other person doesn’t violate your “rules” for how you want your relationship or life to be, you say that you “trust” him or her. *When trust has been broken, what actually has happened is that there has been a rules violation between the two people. In other words, something either happened or didn’t happen that violated one or both peoples’ rules for what they want in their relationship and they’re upset about it. “Trust” violations can be small things or they can be much bigger issues that can really damage or destroy a relationship. For example… failing to pick up the kids early from the baby sitter because of road construction is no where near as big of an issue for most people as it would be if one person was having an extra-marital affair. 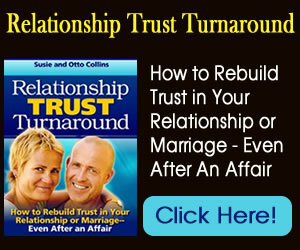 Infidelity is usually a huge trust and rules violation. *You can trust in one area but not all areas of your relationship with that person because of something he or she has done or because of your past experiences. *Creating trust is finding and living in harmony with people who want at least something of what you want, want to live how you want to live and have similar values and “rules” and are willing to live in these ways. In other words, there is enough of an overlap of the other person’s rules that fits with the life you want to create for yourself to create trust between the two of you. **Claire feels strongly about recycling in her home. Her husband and two kids don’t feel as strongly about recycling as Claire does (it’s not a “rule” for them) but they agree because they see value in doing it–and also Claire has such conviction about it that they want to support her. Claire trusts that they will recycle but when they slip up every now and then and forget, she doesn’t make a big deal of it because she knows it’s not their passion but hers–and she sees that they are making a constant, good effort at doing it. When there is conflict between Patty and Bill, they each have different “rules” for how they deal with it. Patty withdraws into silence to let Bill know how much he has hurt her. Bill gets angry and pushes Patty to talk with him. In this case, Patty is trusting that her silence will communicate her upset to Bill and Bill is trusting that if he just keeps pushing, Patty will open up and talk with him. They keep doing this over and over again, nothing ever gets resolved and they don’t trust each other. 1. Take a conscious look at your rules that seem to be in conflict with the other person’s rules. What is the rules violation between the two of you? In our Bill/Patty example–Bill’s rule is that you talk out conflicts until they are resolved and if you don’t get cooperation, you push to get it. Patty’s silence and withdrawal violates his rule for resolving conflict. Patty’s rule is that Bill should know what he had done and she shows him her upset with her silence and by ignoring him. Bill’s pushing her to talk to him violates her rule that he should know what’s wrong without her telling him. 2. Find an overlap in your rules, even a small one and build on it. In our recycling example, there was enough of an overlap in the way the family wanted to live that they could come to an agreement of their rules for living on this topic. For Patty and Bill, however, they were so stuck that they couldn’t see any possible overlap. 3. If there’s little or no overlap, take a good hard look at your rules to see if they are serving you–getting you what you want. Change them if those changes are in alignment with how you want to live your life. Neither Patty nor Bill are getting what they want from their current rules so they each chose to step back and see if maybe another way might work better. Bill agreed to pull back his energy and not push when there was conflict. Patty recognized that maybe Bill wasn’t a mind reader (and didn’t need to be one). She agreed that she’d practice opening up and saying what she needed to say to him. They could adopt and practice different rules for their lives. 4. If neither person is willing to look at making changes in their rules–or they simply don’t want to, both people have to evaluate whether they want to continue the relationship the way it is or not. So this week we suggest that you look at where you have conflict or trust issues (we all have them) and see where there might be a rules violation. Our loving advice is to be as conscious as possible about your rules for living and watch how your life and relationships improve.